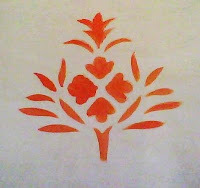 Stencils are easily available in craft shops and really useful for a repeat design on table cloths , bedsheets , napkins etc. Earlier I used to wonder as to how people could make so many designs repeatedly ! Single color painting with stencils is quick and neat as it can be completed in one stroke of the paint roller if you can get hold of one . I have used a flat brush to do the needful. 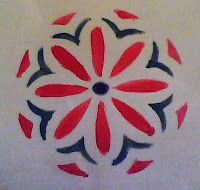 After painting in single color I became adventurous and used the daisy stencil in two colors . One can make stencils at home using old x-ray sheets , or even paper . Paper stencils are of course not as sturdy as plastic ones which can be washed after use. 1 Wash the fabric , iron it.Select fabric/ acrylic paints according to the design . 2 Lay the stencil on the fabric on a flat surface. 3 Masking or cello tape can be used to keep the stencil in position. 4 Do not overload the brush with color or it will seep out of the edges. 5 Dab the brush or if you are using color then just give one flourishing stroke across the design if you have a large flat brush . 6 Start from the outer edges moving to the inner part , this will hopefully keep the color from spreading. 7 Paint all colors in the design and then lift up the stencil or repositioning will be dicey. 8 Let the paint dry for 24 hours. 9 Iron the fabric on the wrong side as in fabric painting. 10 Wash the stencils to remove the paint and store . Thanks , you are welcome !